Subtle, sweet, salty, and slightly addictive, our Vermont Maple & Sea Salt is a little like kettle corn excpet with the smooth sweetness of maple. Like all of our popcorn, we never use GMO crops, coatings or chemicals on the bag, or any other scary stuff! This is truly microwave popcorn reinvented. Learn more about Quinn Popcorn on their website. I generally like iced tea with popcorn, because I like something I can drink easily (not so hot that I need to blow on it to cool the surface!) to help tone down the saltiness as it builds on my palate. I wanted something crisp and clean, something that wouldn’t interfere with the yummy flavors of the popcorn. I chose to chill some Dragon Well Tea from Foxfire Teas, and it was just perfect. The tea was sweet and mild, slightly vegetative, and allowed the flavors of Maple from the popcorn to really shine through. Yummy! This review is LONG overdue. I received this popcorn in my Earth Day Foodzie box (yes, that’s right, back in April), and I did eat one bag of the popcorn back in April. It was so good, and impressed me so much, but the flavor was so distinctly autumnal, I decided to save the second bag of microwave popcorn for an evening later in the year, when the maple flavor would be something I really savored. This popcorn reminds me a little bit of the original Orville Redenbacher’s flavored microwave popcorn varieties that were released a few decades ago … back when the cheese powder or the caramel were packaged separately from the popcorn, and you’d first pop the popcorn and then add the caramel or cheese powder. Not in flavor or quality, mind you, because this is infinitely better than anything I’ve ever tasted from Orville Redenbacher’s, but because the flavoring comes in a separate pouch and you sprinkle it on yourself after the popcorn has been popped. But that’s where the similarities end. First of all, unlike the microwave popcorn that you buy in the grocery store, this is not all caked onto the center portion of the bag, because there is no oil or whatever that congealed gunk is in the microwave popcorn bag. The popcorn in this compostable, chemical-free bag is loose, freely roaming in the popcorn bag, not stuck together in some weird goop. After the popcorn has been popped, you open the bag, and pour in the package of canola oil. According to this, the oil used is supposed to be good for you, or at least better for you than aforementioned caked gunk that is in the other microwave popcorn bags, and I’m inclined to believe it. I don’t know why I believe it, I just do. congealed goop versus clear, pourable, expeller pressed canola oil. This canola oil doesn’t really impart a lot of flavor, but it does keep the powdered flavor of maple sugar and grey sea salt on the popped corn kernels. I like that these flavor pouches come separately, and I can choose how much of each ingredient I want in my popcorn. I used half the pouch of the oil, and I still very much enjoyed the popcorn. This did result in some of the maple and salt ending up loose, in the bottom of my bowl rather than stuck to popcorn, but I didn’t really seem to mind as the bowl of popcorn vanished in record time. The popcorn – underneath the flavored sugar and salt, underneath the canola oil – is the key to what makes this popcorn so much better than any popcorn that had been popped in a microwave. It is light and fluffy. Tender yet crispy. The hulls are thinner and not as hard as some other microwave popcorn. Even without the flavoring, this is easily the best microwave popcorn I’ve ever had. But the flavoring! Oh wow! Maple sugar and grey sea salt. Do I need to say more? This is the best kettle corn ever! This flavor of popcorn could easily be a vegetarian’s substitute for bacon. All that’s missing is a little bit of smoke, which could easily be supplied by tea if you choose a Lapsang Souchong like the one I mentioned above. I requested an air popper for Christmas, because I do prefer air popped popcorn. I like the option to serve popcorn without any additives (although occasionally, I’m sure I’m going to melt some butter and have a little sea salt on it), but, for the times when I want flavored popcorn, I’m probably going to order some Quinn’s Popcorn online. I want to try the other flavors too! This stuff is outstanding! My one complaint: I wish there were fewer unpopped kernels in the bottom of the bowl. Other than that, this popcorn is without fault! picture from BigSpoon Jam. Click on the pic to go there! I received a jar of this jam in my Seattle tasting box from Foodzie, but I’m just getting around to reviewing it now… yes, I’m behind on my reviews. Sorry! Local berries star in this perfectly sweet preserve. Super for yogurt, swirl into oatmeal or warm and pour over ice cream. The daring may try muddling or shaking into a mixed drink. Learn more about BigSpoon Jam on their website. Since I typically enjoy jam on toast and when I eat toast, it’s usually breakfast time, it seemed only natural to choose a breakfast-y blend to enjoy with this jam. This Capital Breakfast blend from Capital Teas is one of the best I’ve tried recently! It has a very rich flavor with a hint of smokiness that really accentuates the unique flavors within this jam very well. When I first opened this jar, I thought something might be wrong. This did not look like jam to me. It looked more like strawberry sauce, like the topping my gramma would make for strawberry shortcake or to ladle on top of morning waffles. The strawberries are HUGE in this jam, and the rest of the jam is really quite runny, like sauce. It cannot be spread, like most jams or jellies, because there are the large, whole berries that have been rendered quite soft from the cooking process, and then there is the liquid, which when spooned over the toast, just sort of absorbs into the toast and does not allow itself to be spread. But that does not mean that it isn’t absolutely delicious – because it is! The berries are BURSTING with fresh taste, they taste like they are fully-ripened on the vine and full of that delicious strawberry flavor which is accentuated with a touch of vanilla to give it more sweetness and a hint of creaminess too. The lemon is very slight, just enough to give it an acidic brightness. Even though this is a very runny jam, it really is delicious and very well balanced. I would not recommend it for your toast, but instead, do as suggested in the product description (above): add it to your hot cereal, or perhaps top your ice cream or yogurt with it. This is delicious, but it is probably not something I’d buy for myself because it is a bit pricy and as a hot cereal/ice cream/yogurt topper, when used liberally, there would be about four uses in the jar. That’s a pretty expensive ice cream topper. Yummy … but there are a lot of other delicious jams out there that are prices a bit more reasonably and this just wouldn’t be worth it to me. All that said, this addition to the Seattle tasting box certainly did increase the value of the last box I received from Foodzie – and that makes me happy! This is the long overdue review of the Chile de Arbol spice that was featured in the “Some Like it Hot” tasting box from Foodzie (sigh, how I miss the old Foodzie … before all the changes when it was more like Etsy for food artisans). This isn’t my first time trying the spice, but it’s the first time I’ve taken the time to sit down and compose my thoughts on this rather heated product! Err… well, what I mean is, this spice has got some HEAT! Closely related to the cayenne chilies, it has a tonic, smoky, and grass flavor with acidic heat. The heat level is 7 and the Scoville Heat Unit is 15,000-30,000. This chili powder can be used in soups, stews, and sauces. Learn more about Whole Spice on their website. Photo from Whole Spice. Click on the pic to go there. For the purposes of this review, I sprinkled the Chile de Arbol powder over a couple of fried eggs. Not a heavy sprinkling, because as I’ve learned from previous tastings of this spice that this does not require a heavy hand to taste it! The amount of heat that this gives off reminds me of cayenne pepper. But it also has a smokiness to it that almost reminds me of chipotle. There’s even a hint of earthiness to this. If one were to somehow “marry” the flavor of the chipotle and the heat of the cayenne, they’d have something a bit like this ground Chile de Arbol. And I’m liking that! I love the dimension of flavor that comes with this Chile de Arbol. Sure, it’s got some heat, but as long as I don’t go overboard when I sprinkle it on something, it adds just the right amount of kick to my fried eggs, and I’m thinking that I may just have to try adding this to my taco meat the next time I make tacos, and to my chili the next time I make that. This may even add a compelling dimension to a cup of hot cocoa the next time I’m in the mood for something creamy, rich and with a little bit of bite to it. This has a nice amount of heat as long as it’s used with a careful hand, and it adds more than just heat to the dish. It has a pleasant earthiness to it, and an enjoyable smoky tone that is somewhat reminiscent of the chipotle (just hotter!) This is something I can see myself keeping in my spice pantry for when I make chili (I’ll be making lots of it in the cooler months ahead) – in fact, I think that this may be replacing the cayenne pepper that I normally keep for when I make chili. This has about the same heat but will add some other desirable flavor to my pot of chili! Picture from Chukar Cherries. Click on the pic to go there. Sweet Bing and Rainier cherries alongside Montmorency Tarts. Ideal if you want to try all three varieties of our Northwest cherries and don’t know which one to choose. Learn more about Chukar Cherries on their website. These cherries make a wonderful alternative to the typical tea-time treat! I like these with iced tea too, but, I think I like them best with some hot tea – and I found these cherries to be especially delicious with this Laoshan Apothecary Green Tea from Verdant Tea. The tea is so pleasantly balanced with a gentle warmth of the spices in this blend, as well as the exhilarating taste of the mint really brought out the flavor of the cherries in a very interesting way. Even the creamy, buttery elements of the tea enhanced the flavor of the cherries. The cherries became sweeter, while the tart elements also emerged. I could even note some savory elements to the cherries that I had not previously tasted. These cherries are remarkable. The first thing I noticed about them is the size of them. I’ve had dried cherries before (I try to keep dried fruits in the pantry, as I like to add a handful of them to my hot cereals when I make them, and they make an excellent snack that is a bit healthier than my usual sweet go-to snacks, and they taste great! ), but these seem so much larger and plumper than the ones I usually get from the supermarket. I also like that they don’t feel as sticky as the other cherries I’ve had before. There is a slight stickiness to them (I think this is normal with dry fruit, although I don’t consider myself an expert), but, they don’t feel super sticky or oily. Another thing that I’ve noticed as I pour these out into my hand is that they aren’t all clumped together – they aren’t stuck together. I have a slight aversion to stuck together dried fruit … and there’s a reason behind it, and it’s one I don’t like to discuss because it grosses me out. It is the reason that I pretty much refuse to buy raisins anymore, and whenever I encounter a recipe that calls for raisins, I substitute dried cranberries. And really, this is a very disturbing subject for me, especially when I’m eating, so I’m going to stop talking about that, and move on to these cherries! I’m really enjoying these … they make a fabulous snack. I like that there are a couple of sweet varieties along with one tart variety of cherry, so that you get a nice “medley” of flavors as you eat. They’re bursting with flavor! They have a very satisfying, chewy texture, and a handful or two is enough to satiate the hunger pangs that hit in between meals. Sweet, with a delicious “juiciness” that makes my mouth water, and just enough tartness to keep it interesting. I really like these. I love that it is a medley of cherries, and not focusing on just one – I think that this provides a more satisfactory taste because it appeals to both the sweet and the tart. For an even more satisfying snack, I like them served alongside something a little bit salty, like peanuts or cashews. I also LOVE that this is a local company (well, somewhat local … Seattle. The other side of the state, but, still, within the state!) This is a brand that I will keep an eye out for when I visit Whole Foods or New Seasons next time, because I’ll be wanting more of this when it’s gone! 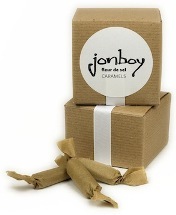 Learn more about Jonboy on their website. I actually enjoyed these caramels on two separate occasions. The first time, I had a glass of iced tea at my side, and I really loved this RadioactiTEA Iced Tea from 52Teas with these. One of the best “pure” iced teas I’ve had in a very long time, and the sweet flavors of the Assam complimented the flavor of the caramel quite well. Based upon that experience, I decided to try another Assam with this tea – this time, I served it hot. This 2nd Flush Assam from Tea Horse went along with the caramel tones very nicely too. These caramels make a really decadent tea-time treat! When I saw that Fleur de Sel Caramels were going to be included with the Seattle Box (my last box from Foodzie! ), it was probably the main selling point for the box and what led me to ultimately decide to choose the Seattle Box over the other selections. I mean, why go healthy with the raw food when I can have salted caramels, right? I mean, if I’m in a sample line at Costco (just using Costco as an example, since that is typically where I find many sample tables!) and I have to choose between a sweet, creamy salted caramel and a raw granola health food concoction, I’m going to choose the salted caramel every single time. Sure, I enjoy a good granola bar, and I’ve reviewed a few here on this blog… but, when it comes to my taste buds preference, well, I’d say they’re more sweet toothed than health foodie. I know I’ve mentioned before my adoration for salted caramels … and while I didn’t know which company was going to be supplying the Fleur de Sel Caramels. There was part of me that was sort of wishing for Fran’s Chocolates, because, well, they hold a special place in my heart as I’ve mentioned before. But even if it wasn’t Fran’s Chocolates – and it wasn’t! – I was still excited over the opportunity to try a new candy company, and, well, caramel generally just makes me happy. And these salted caramels are making me very happy! They are soft and chewy and absolutely yummy. These aren’t the hard-to-chew kind of caramels that seem to require a good amount of effort on the part of the jaw to break down … these are so soft that the teeth sink right into them. I can feel the Fleur de Sel in these, it isn’t a hard crunch but there is a slight texture from them. The salt is mostly noticeable in the taste though, and there’s no mistaking it. I love the sharp contrast between the creamy, sweet caramel flavor and the salt. The salt cuts right through it, eliminating that cloying sensation that I’d probably experience with unsalted caramels. Completely and utterly yummy. I really loved these caramels. Maybe not quite as fancy as Fran’s Chocolate salted caramels, but for simple, pure salted caramel enjoyment, it doesn’t get any better than this. My only complaint is that I wanted more. The package in the box was not one of those boxes in the photo at the top… it was a smaller package – not quite a sampler with only two or three caramels, but, not quite a box either. I don’t know exactly how many were in the package because I tore into it and started eating before it occurred to me that I should count them. Learn more about Beecher’s on their website. 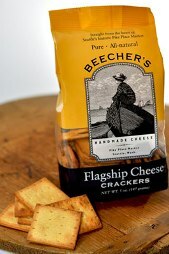 Crackers are a favorite tea time snack of mine, preferably with cheese … and these have the cheese baked right in. I enjoyed these with a cup of Good Afternoon Tea from Grey’s Tea. The smokiness of the tea lent itself very well to the delicious cheesiness of these crackers (and I do love a good smoky cheese!) A very yummy pairing! These crackers kind of threw me off at first… the texture kind of threw me off. I thought that maybe they were stale because they didn’t have that light and crisp kind of texture that you get from other (commercial-type) cheese crackers. These are denser and crunchy … but it took eating a couple of crackers to realize that they aren’t actually stale, they’re just not your typical cheese cracker. And it’s not just the texture that’s different… it’s the cheese too. I can really taste the cheese! And it doesn’t taste like some artificial cheese. This tastes like cheese that you might taste at the cheese bar in Whole Foods. I can taste the quality in this cheese. It tastes rich and sharp and delicious. The cracker is lightly salty, and has a pleasing tangy cheese note. Easily, the best cheese cracker I’ve ever tasted. Overall the crackers are really outstanding … even if they do throw you for a loop at first! They are deliciously crunchy and satisfying, with a distinct cheesy taste and a hint of saltiness. They are wonderfully savory, something that I definitely will be buying again at my local Whole Foods (I was so excited to find them there the last time I was shopping, but I didn’t buy them because I knew I was getting some in this box). Partially popped. And fully delicious. Savor the crunchy heart of air-popped kernels. Revel in flavor that’s positively packed in – not lost in the fluff of ordinary popcorn. Learn more about Halfpops on their website. With these buttery, salty snacks I recommend iced tea! These would be great with hot tea as well, but they have that snack-y kind of appeal that just screams iced tea to me. Today I’m sipping on some cold-brewed tea from 52Teas newest brand: Southern Boy Teas, and I’m drinking the RadioactiviTea “flavor” – which isn’t really a flavor at all, but pure, CTC Assam teas. The natural fruity notes provide a lovely sweetness which is a very enjoyable contrast to the salty, buttery goodness of these Halfpops. The half popped kernels have always been a “secret” pleasure of mine, I would always dig for them at the bottom of the bowl… but I didn’t realize that other people loved them as much as I did … enough to create a whole new snack around them! These kind of taste a bit like Corn Nuts, only they’re better, because they don’t taste overly processed. The Corn Nuts, while enjoyable because they’re crunchy and have a tasty corn flavor, have always tasted just a bit artificial to me … very junk food/corn chip like to me. But these taste more like popcorn. Oh sure, I’m sure they still qualify as “junk food” with all the salt and buttery flavoring, but they don’t taste overly processed. They have that natural crunch and sweet corn taste of real popcorn, because that’s what it is. These aren’t uniformly shaped and processed. They look like what’s at the bottom of the popcorn bowl, only… there’s more of them! Hey, Halfpops, if you’re reading this, you should team up with Bourbon Barrel Foods and make a Bourbon Smoked Paprika flavored Halfpops. Or… a Bacon flavored Halfpops would be good too. I really like these. I was kind of underwhelmed with the idea of them being in the box at first, but, I’m glad that Foodzie included them. They are sure to satisfy that crunchy snack craving when you get them: they are a little sweet from the corn and the butter, salty, and irresistibly good. My only real complaint is that there are a lot of “empty” shells in the package – the hulls that have shed off of the Halfpops. A minor irritation, really, not a big deal, but something I think is worth mentioning. I see that these are available at my local Whole Foods, I think I’ll have to look for them the next time I’m shopping!